Ok - so sometimes in life...you gotta find something FUN to enjoy as a parent! So... here's some crazy stuff to smile at! Do you have a super bald baby?!?! lol. Get your baby bangs today! They aren't very cheap though. But sure make a fun gift. They have a really fun story by a mom behind them. Get sick often? Get yourself some DESIGNER BARF BAGS!!!!!!!! Seriously. Yep. $13 for a pack of 20. Oh my gosh do I LOVE LOVE LOVE this!! 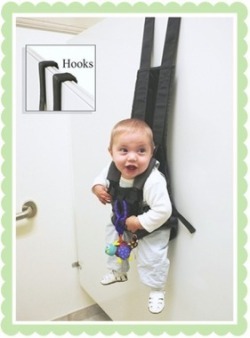 How many times have your been out of your mind having to peewhen you're strapped to your baby? Hmpf. Created by 2 sisters with 7 kids between them...YEAH. They NEEDED to come up with this! $40 but product does not come with a baby. Love the smell of baby and never want it to leave?